Starting now, if you own the Switch and Steam versions of Civilization VI, you can swap your save between the two fairly easily. 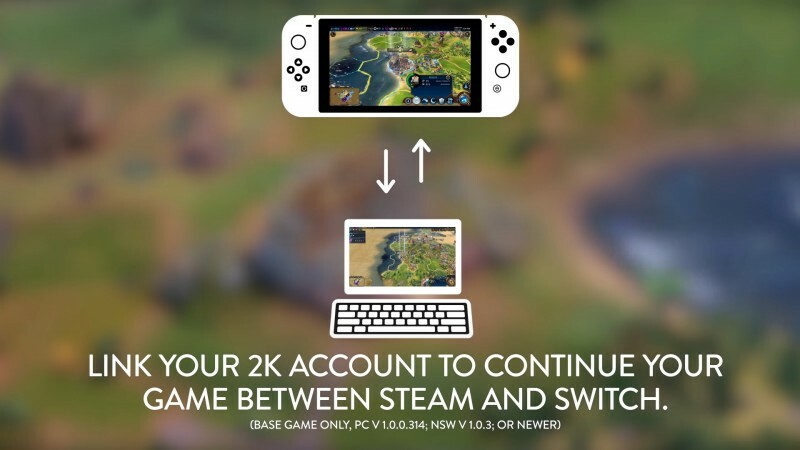 By signing in to a 2K account on both versions, you can upload and download saves in the cloud between the two versions, thus making the Switch version of Civ VI an even better companion to the PC game than before. All you need to do in-game is check a box in the save menu called “multiplatform cloud,” save your game, select that option from the same menu on the Switch, and you’re on your way. The Switch version, while perfectly competent, was never going to match the experience of playing Civilization on PC, but being able to – like you would with any Switch game – play at home on PC and take that save with you on the go with your Switch is a cool feature. The cross-pollination of online multiplayer games with the Switch is already an exciting trend, not to mention fun collaborations between Microsoft and Nintendo with titles like Cuphead. However, being able to move saves back and forth is something I would love to see more of.